To compete in level 6 gymnastics, a gymnast must be able to do the following skills on each of the four events. 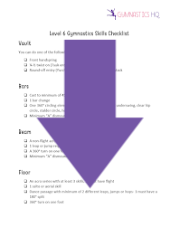 In addition to the skills listed below, level 6 routines must each have 5 “A” skills and 1 “B” skill. In gymnastics, each skill has a value, A’s are the easiest all the way up to E’s, which are the hardest. So when the choreographer is choreographing the routine, he or she will need to make sure to add the right amount of skills and difficulty. 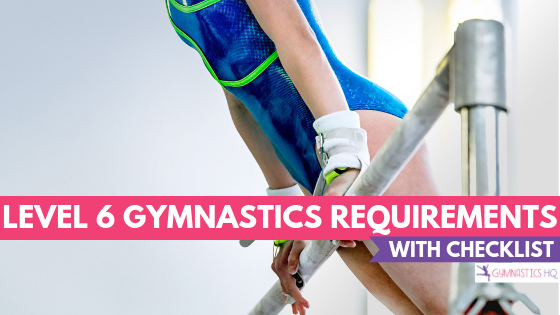 For an overview of the optional requirements you can check out this cheat sheet from the USA Gymnastics website. 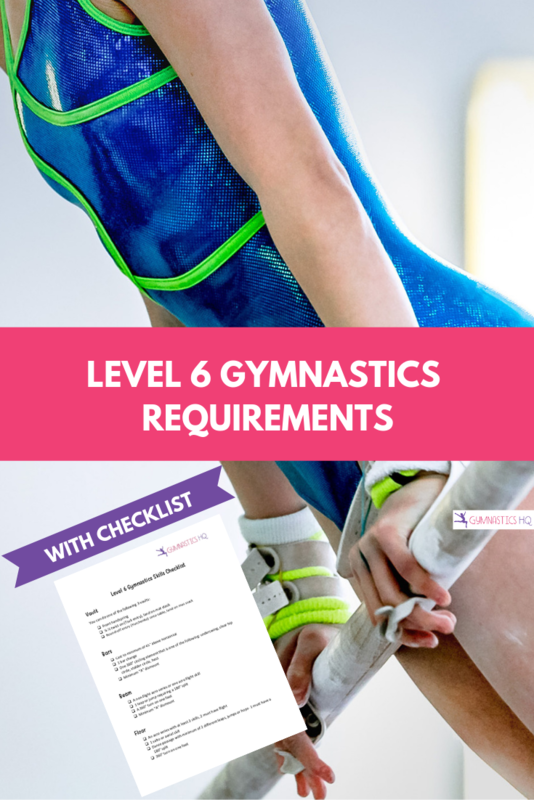 Once a gymnast can perform routines that meet all these level 6 requirements, and she has passed out of level 5, she may compete in a level 6 meet. Level 6 may be skipped if a 32 AA was scored at Level 5. After successfully completing level 6, she can move on to level 7. Is there any gymnastics places in South Korea? I would think there are, but honestly I have no idea 🙁 Sorry! Maybe someone else here can help? Yes!! Not many, but there are quite a few gyms for tumbling. (*Not many actual “gyms” with teams and all the apparatuses for artistic.) Rhythmic gymnastics is a lot more common so there are more competitions for rhythmic. I started off with rhythmic because I wanted to compete, then switched over to tumbling. Many of our gyms.in our area don’t compete Level 6? Is that because this level can be skipped without a mobility requirement? A back walkover is not a necessary skill. Most people in high levels compete a back handspring instead of a back walkover. Unfortunately I dont know. But my daughter has the same issue. Her coach makes her do cartwheels instead of a back walkover. I just dont get it because she wont be going down a level so she is practicing for nothing. How long do the level six floor routines have to be ? Do you have a list of what “A” and “B” skills are? My daughter is working on some of the dance portion of her floor routine with a dance teacher, not a gymnastics coach. We are trying to determine which moves are “poses” and which are considered “jumps/leaps”, and what their value is. Do you ever have to get a presshandstand ? I don’t know if I am level 5 or 6. If you can do everything in Level six then you’re level six if not probably level 5 cause to be a level you have to be able to do everything in that level. Hey, I was wondering if there was any gymnastic places in Ho Chi Minh Vietnam? i’m moving there and gymastic is my dream… even though im 11 and i can’t do anything. Yeah, I need that one answered also! Hi, I’m a young gymnast in level 6, and I’m moving soon. I’m moving to South Carolina, does anybody know good gyms there? thanks. I purchased the progression checklist in 2016 (I think). Has it changed? Hey Jess! Just wondering if this version is updated to the new code, as I may be going into lvl 6 and I am unsure if I am ready. Please respond soon! I’m trying to get a backbend can someone give me some tips on how to get it? My daughter is competing level 6 this year and doing front HS to Front tuck can she change to Front HS to front layou? Or is that not allowed in 6?